During the Purdue Liberal Arts Dean’s Advisory Council meeting, dinner got pretty animated as we discussed the recent college admissions scandal. Once we got beyond the “watching a train wreck” aspect of the story, the conversation quickly evolved to an issue Joe Cahill highlighted in Crain’s: we need to stop relying on college brand, major, and GPA as signals of a good hire. Not only does the data show that academic pedigree does not predict career success, anyone who has hired college students has seen this firsthand. 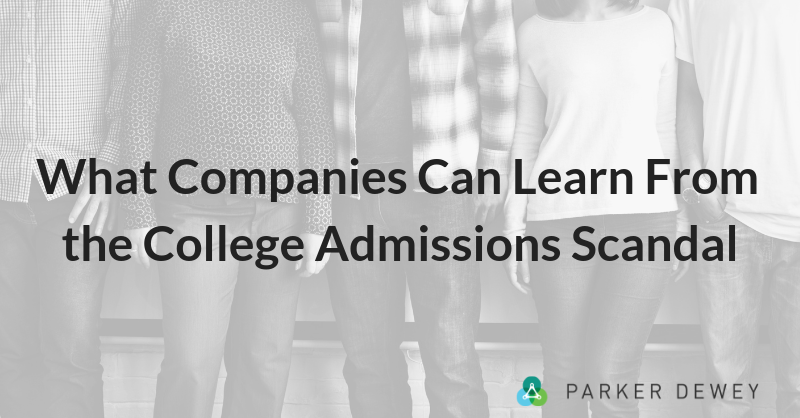 Unfortunately, neither the data nor these experiences have impacted the traditional campus recruiting processes - companies still conduct their annual pilgrimages to the same elite schools to compete for the same students year after year. Beyond limiting the talent pool and driving record attrition levels for recent college grads, as Cahill noted, this also limits professional opportunities for college students from underrepresented backgrounds. Interestingly, companies are frustrated with what they perceive as a tight labor market, while according to the Strada Foundation, an organization that helps students achieve professional success, over 40% of recent college grads are either under or unemployed. As the founder of an organization whose mission is to improve college-to-career transitions, I consistently hear from these graduating students about their inability to even get interviews with companies as they are “filtered out” based upon their school alone. However, during the past four years, I’ve had the opportunity to work with thousands of these students – on behalf of hundreds of companies – on their college-to-career transitions. I know they have the skills, grit, and ability to thrive in their professional endeavors if given the opportunity. What made me most optimistic about this situation is that it will hopefully serve as a catalyst for companies to reflect upon the flawed assumptions that academic pedigree equals professional potential, and explore other ways to identify, assess, and hire recent grads. We’re also seeing the colleges respond, as schools such as Purdue implement new efforts to help students demonstrate skills that aren’t captured by major or GPA (eg communication, problem solving, grit, etc. ), and are in fact most valued by companies. Not only do the students benefit, but these programs provide an effective way for companies to stop using academic pedigree as a proxy for ability – not only does this support the community and drive diversity in a sustainable way, it leads to better business outcomes.